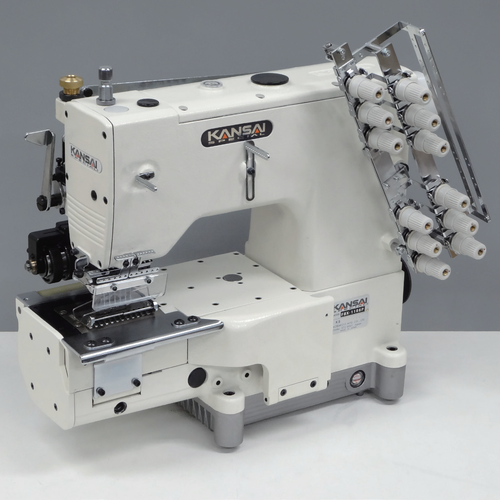 FBX series is a cylinder bed, 2～6 needle double chainstitch machine with needle feed mechanism. It is designed for sewing waistbands of medium heavy to heavy material such as jeans and working pants. As needle feed mechanism and lower feed mechanisam are linked, both feeding amounts can be adjusted at the same time by push button. The rear puller mechanism also secures the feeding. This needle feed mechanism can solves problems, such as twisting, puckering and slipping of the materials. FBX series has a wide range of applications as it can sew the material up to a width of 70mm, especially tubular goods like waistbands.